You can make toffee without a candy thermometer but it is definitely more reassuring and accurate to use one so have one ready! In the picture above, you see what's needed for this toffee project. It's just a few simple ingredients and some time and care to cook the mixture. Remember, sugar cooked to 300 degrees is extremely hot so you want to use a stable heavy-bottomed pan and whisk the mixture carefully. As you stir, the mixture might break but it comes back together. I was a little worried that my toffee was turning too dark - but in my (albeit limited) experience, it's always dark like this (and sometimes it doesn't match the recipe photo I see) and the texture, when eaten, is just right. I stir in the hazelnuts once the mixture reaches 300 degrees and then careful spread the screaming-hot toffee onto a parchment-lined baking sheet. The recipe calls for using a greased silicon mat but I find parchment paper works just fine and makes for easier cleanup. After a minute, sprinkle chocolate chips over the toffee. If you're like me, you worry that the chocolate won't melt, but it will. Once the chocolate sets, chop it up into random-size pieces. 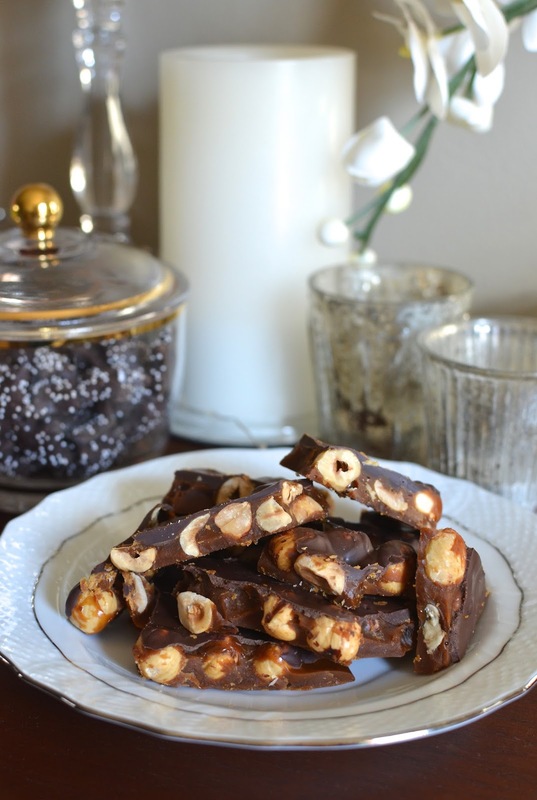 Your chocolate hazelnut toffee is ready for nibbling and gifting! This toffee was a sweet way to wrap up the holidays at my house. Overall, we just ate up the holidays! We devoured plenty of homemade treats and meals but also savored lots of seasonal treats we got our hands on. No one was hungry the past few weeks and frankly, no one's really slowing down either. It's cold and we need all the goodies! Here's to a 2018 filled with abundance - of all things good and smile-inducing! Grease a baking sheet and line it with parchment paper (you can also use a lightly greased silicon mat); set nearby. Place butter, sugar, and salt into a medium size saucepan. Over medium heat, whisk until melted and mixture comes to a boil. Cook, whisking occasionally, until mixture reaches 300 degrees on a candy thermometer (remember mixture is very hot so handle with care). Immediately remove from the heat and stir in the hazelnuts. Pour the mixture into the prepared baking sheet, smoothing it out with an offset spatula. Let sit for about 1 1/2 minutes, then scatter the chocolate chips over top. As the chocolate chips melt (give it a minute to sit on top of the hot toffee), spread it with an offset spatula to evenly cover the top. Freeze the toffee until set, about 30 minutes. Peel toffee away from the parchment paper. Cut into pieces using a sharp knife. You can keep the toffee in an airtight container for at least a week. Happy New Year to you too, Monica! These toffee bites look out of this world! Happy New Year Monica! So glad you were able to enjoy some quality family time and that is what this time of the year is all about. Roasting the hazelnuts first...Brilliant. Will bookmark this for next holiday season. Happy New Year! Toffee recipes like this is a great thing to have in the arsenal. Wow this toffee looks great. And it sounds like you had a wonderful holiday. I love these slower days too - holidays seem so rushed now days and yes it is so cold! Hope you get a little warmer weather soon - and then send it down my way. Take care - Happy New Year and have a great week! Happy New Year! These toffees have my name written all over them! Hi Monica, we love toffee especially anything with hazelnuts but it has always seemed so complicated to make, you certainly make the whole process sound easy. Glad you had a wonderful holiday, I love everything about the holidays and the beginning of the new year. Take care! I totally hear you. The toffee is quick to make but you need to find a good time when you can focus on it. Holidays was great and we really enjoyed it as much as possible. Have a great 2018! Same here my friend, I am slowly getting back into the routine after coming back from India. 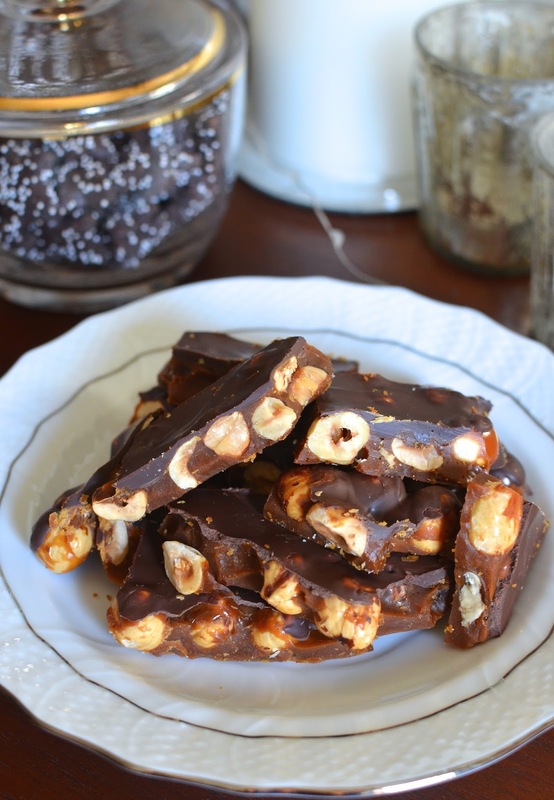 This toffee looks really good and easy. I always have dark chocolate chips in my home. Hope your trip to India was wonderful! And same here - I always have dark chocolate in bars, chips, chunks, etc. All kinds in this chocoholic household! : ) Happy 2018! This looks SO good! What a lovely thing to keep in the kitchen to have a nibble on! It looks amazing! I am rarely eating chocolate, but when I do it is mostly chocolate with whole hazelnuts inside. I think your homemade version is better than any brand I could buy. I am a huge fan of chocolates with whole hazelnuts, too! We ended up getting quite a bit of snow here last week and I was so glad our power didn't go out (it was SO COLD!!!) haha ANYWAY. I haven't made toffee in ages! I love that you used hazelnut! Happy new year Monica!! It sounds like you and your family had a delightful holiday together. Your toffee looks so good and I'm sure added to your enjoyment.